With Valentine’s Day around the corner, 123Dentist.com Community Network has some tips for how you can have that dazzling smile for that special someone. If you have somebody in your life that you want to impress this year, here are some extra steps you can take to ensure your beautiful smile shines through. For a white smile, there are temporary steps you can take at home to enhance your smile and permanent steps, where a dental professional can provide treatment options to improve the shade of your teeth. This blog post will focus on steps you can do at home to get you ready for your Valentine’s Day. The steps you can take at home can help your smile look its best for any occasion. They are simple and require your dedication and commitment in order to have a whiter, healthier smile. 123Dentist.com take home whitening kits—visit a 123Dentist.com location to take impressions of your teeth for your personal, take-home whitening kit. It takes a few days to fabricate your personal trays and when you return, you can take home your trays to use. When you are at home, spread some whitening gel on the trays and leave it in your mouth overnight. We usually recommend doing this for ten nights in a row. Try to avoid bad habits—bad habits, such as smoking, can cause your teeth to stain. Smoking or nail biting can also lead to additional oral health concerns that could affect your smile. Wear lipstick—if you are a female, wearing lipstick can help you bring out the whiteness of your teeth and bring out your healthy, beautiful smile. If you are interested in permanent whitening options for your teeth, such as Zoom! Whitening, visit a 123Dentist.com location today for more information. 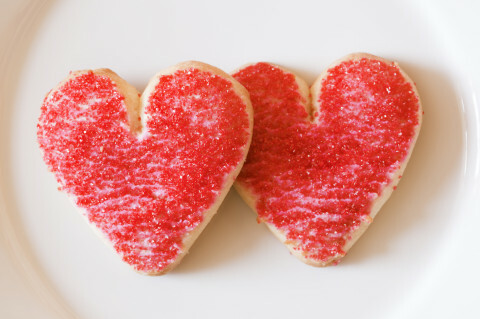 Happy Valentine’s Day from the 123Dentist.com Community Network!